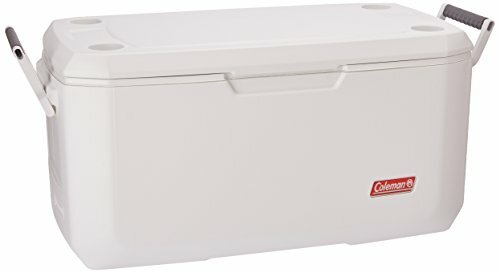 Keep your food and drinks cold for the full length of your next boating excursion with the Coleman 120-Quart Coastal Xtreme Series Marine Portable Cooler. Specially designed for boating and fishing, this portable cooler combines a generous capacity with a rugged design that stands up to tough saltwater conditions. Large enough to store up to 204 cans, the cooler offers plenty of room for beverages, food, and any catches you might haul on board. The insulated lid and walls offer up to six days of ice retention, helping ensure your catches stay fresh even during multi-day voyages. Built to withstand years of rugged marine usage, this heavy-duty cooler comes equipped with rust-resistant stainless steel hardware and UVGuard sun protection that resists yellowing and cracking. A threaded drain with an easy-to-clean valve allows you to easily empty excess water without tilting the cooler. The smooth EZ-Clean lid easily wipes clean of grime and dirt, while the Have-A-Seat lid offers a comfortable place to sit and relax. And thanks to its comfortable no-crush handle grips, this fishing cooler is easy to transport, whether you're bringing whole meals on a boating trip or heading to your favorite fishing hole.